*Eve and I had a Disney Radio marathon as we cleaned the cabin the night before this escapade. I had no idea how prophetic Phil Collins's song from Tarzan would be at the time. I should have known better. I haven't really written a blog post in a long time--one that takes thought and planning and rewriting. I don't know if I have it in me any more.
. . . because I have a story to tell you. I knew it was a mistake when I did it. Eve and I finished our chores the night before--scrubbing bathrooms, sweeping and mopping, and packing our stuff. I knew I shouldn't leave a tightly closed black bag of garbage outside the cabin overnight. I was more concerned that I would forget it in the garage when we left before 6 am the next morning and that it would stink everything up before we got up north again. But I left it next to the lidded metal can as I turned out the light and locked the door before climbing the stairs to bed. Four hours later, at precisely 3:18 am, my phone started pinging with Instagram notifications from one of Micah's friends who was leaving on vacation. I quietly cursed her name as I turned over to go back to sleep. Sleep didn't come. The weather had gotten progressively hotter over the week, and even leaving the windows open all night hadn't dropped the temperature upstairs much below 80. I kicked at the comforter, hoping that removing the top layer of bedding would cool me off a little. Nights with no moon are pitch dark at the cabin, and 3:18 am is not only dark but the air is still and thick and quiet. I stayed there in my bed, wishing sleep would come but still enjoying my last night in my cabin bed. It sounded like . . . glass clinking. Very faintly. No. The sound was gone. I must have been hearing things. Is that . . . paper tearing? And was that a . . . grunt? That's when I put all the sounds together. What critter was digging through my garbage? Should I just close the window and pretend I didn't know what was going on below? Would they just leave so I could sleep? Five minutes later and still not asleep, I decided I needed to know what was messing in the trash. As I descended the stairs and got closer to the curtained French doors, I heard more of the feast going on just a few feet from me. It was more than one animal, I could tell, but it was so dark that I knew I would need to turn on the light. I peered through the curtain just as I flicked the switch. Inches from me were the three teenage javelinas that live in a wash on our property with their parents, snorting and digging and tearing and eating everything inside the now shredded black bag. What surprised me most about the chaos in front of me was that turning on the light hadn't disturbed their party at all. Not one of them looked up, and for some reason, that made me mad. Didn't they know they should run when I lit up their antics? Didn't they know they were up to no good? 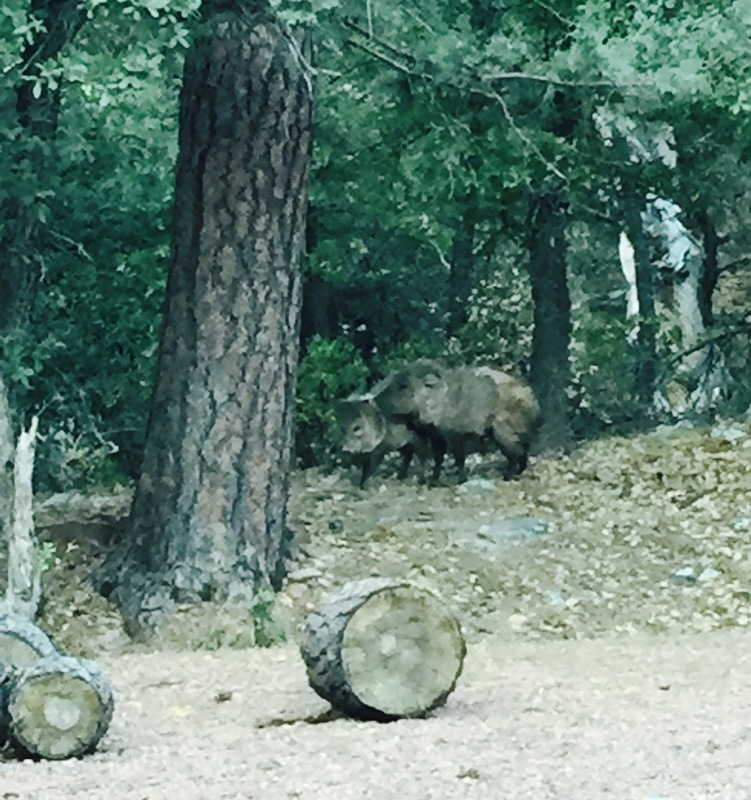 It probably was teen dare night at the peccary compound and nothing was going to deter them from the prize. I didn't want to open the door (mostly not to dirty the windows Eve and I had spent that day cleaning), so I flicked the switch on and off four or five times before they all three squealed and disappeared outside the ring of light. My bad judgment would delay our departure early the next morning when I had to clean up the mess, and as I climbed the stairs, I calculated how much earlier I needed to get up to still get to Flagstaff in time to pick up Lily. When I finally fell back asleep, I had fitful dreams that left me confused and exhausted when the alarm went off less than two hours later. I dressed and made my way downstairs as the sun crept over the rim. How bad was the mess out there? I unrolled a new black garbage bag and proceeded to fill it. One of the projects Eve and I completed that week was cleaning out the fridge and freezer. 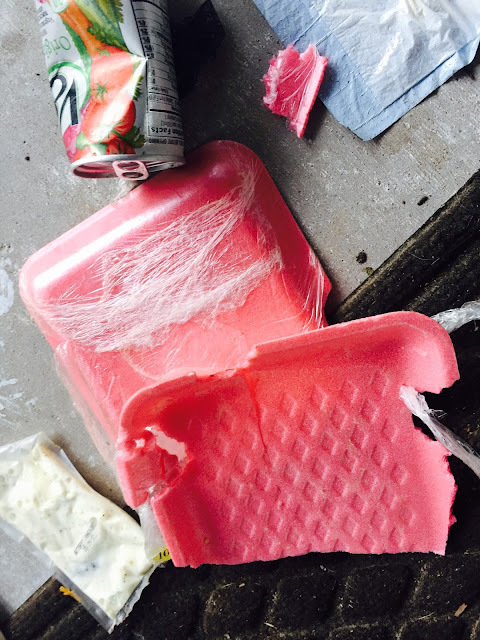 I had thrown away two refreezable cooler packs filled with water and silicon. 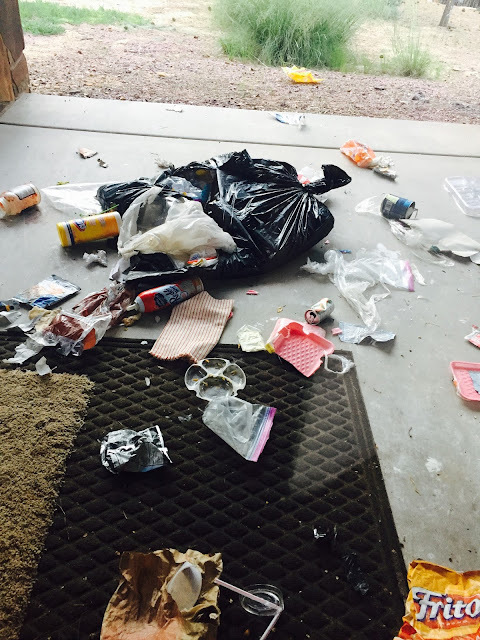 The javelinas had chewed holes in the bags and soaked all of the garbage with the liquid inside, making the cleanup process even more unpleasant. Great. Soaking wet javelina detritus. Thanks. Another addition to the mess from the freezer--melted ice cream. 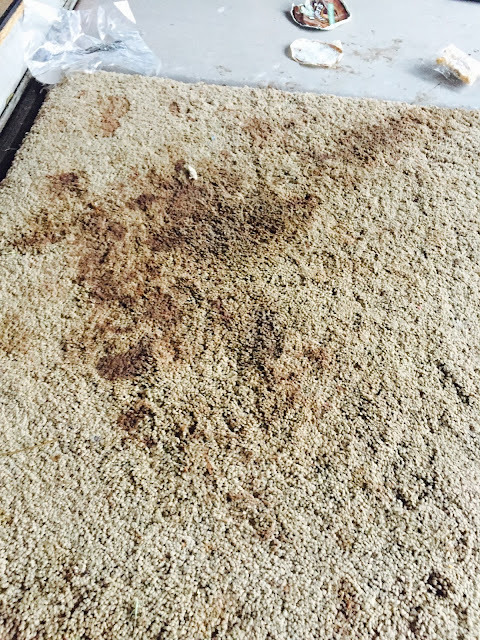 Little known fact: javelinas love to smear chocolate ice cream on rugs. Can you picture the carton stuck over one of their snouts and once they got it off rubbing their face all over the carpet? No longer frozen liquid and chocolate ice cream were not the grossest parts of the mess. The grossest part was picking up obviously chewed wads of paper towels that couldn't be swallowed so they were spit out and left as special squishy treasures for me to find. Back in the trash they went. If you look at this picture below, you can see the teeth marks taken out of the styrofoam tray from our chicken. And the packet of dressing in the bottom left corner had teeth marks in it, but they were unable to puncture it--so out it came. As soon as the mess was returned to the bag, I tied it shut, moved it out by the driver's side of suburban, and began to load the rest of our stuff. I cleaned out the fridge and other food to bring home and tied it in a grocery bag, placing it behind the car with our suitcases. I woke up Eve, grabbed another load, and walked back out to the car. As I turned the corner, who met my gaze but the daddy javelina, sniffing around the back of groceries I'd just brought outside. By this point, I was pretty ticked. I didn't care it was 6 am or that I might wake some distant neighbors. I yelled "GET OUT OF HERE!!" as I waved my arms to chase him away. He retreated a few yards and turned to stare at me. I yelled again, but he was unbowed, adding insult to my injury. When I came back out with my last load of stuff, his wife had joined him, and she stood quietly looking at me as he sniffed and licked her. Just down the hill I saw their three teenagers, up and ready to face the day less than three hours after their evening raid. I felt like Jane and her dad in Tarzan when they walk in on the animals raiding the camp. What were these peccaries thinking? "Stupid human. Wonder if she will leave us any other snacks before she leaves." "How long till she turns her back again and we can make a break for the bag?" "Is she gonna tell Mom and Dad?" A few carrots and pieces of watermelon hadn't gotten tied into the bags, so I tossed them down the steep embankment next to the driveway and the five of them bolted and grunted over to their breakfast. I buckled in my youngest daughter, yelled down the hill at the javelinas, "Don't think I'll ever do that again!" and I drove out of the driveway holding the dripping black bag out of the window, thinking, I hope they have stomachaches all day. Trash goes in a can with a lid for a reason. At least it wasn't bear cubs, right?